The Pakistan People’s Party has released the political will of former leader Benazir Bhutto in which she backs her husband to be party leader. The PPP originally disclosed the contents of the document shortly after her assassination in December. A PPP spokesman said they were now releasing it to end speculation about its contents. Analysts say the document could enhance the political position of Ms Bhutto’s widower, Asif Zardari. Mr Zardari is currently in charge of the party. Their 19-year-old son Bilawal is the titular head. The handwritten, one-page letter dated 16 October says that Asif Ali Zardari should be interim leader until a new permanent party head is appointed. Mr Zardari took over the leadership of the party after Ms Bhutto was killed. She died in a suicide bombing and shooting attack in Rawalpindi while campaigning for elections in December. “I would like my husband Asif Ali Zardari to lead you in this interim period until you and he decide what is best,” Ms Bhutto’s letter states. “I say this because he is a man of courage and honour. He spent eleven and a half years in prison without bending despite torture. The letter – written two days before Ms Bhutto’s return to Pakistan from exile and 12 weeks before her assassination – urged Pakistan People’s Party (PPP) supporters to continue the struggle for change. “I fear for the future of Pakistan. Please continue the fight against extremism, dictatorship, poverty and ignorance,” she wrote. At a press conference to announce the release of the will, PPP spokeswoman Sherry Rahman said that “some enemies wanted to create chaos in the party by spreading false speculation about the contents of the will”. “That is why the party high command has decided to share the will with the public and the media to foil all such controversies and keep the party united,” she said. Ms Bhutto’s killing on 27 December while leaving an election rally in Rawalpindi led to a six-week delay to parliamentary elections now scheduled for 18 February. 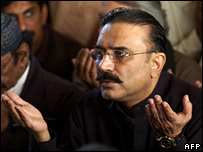 Correspondents say Mr Zardari is a controversial figure in Pakistan, where he has faced repeated accusations of corruption. PPP spokesman Farhatullah Babar said that the release of the will was not being done to strengthen Zardari’s position within the party. He said that the party would formally decide who was the party’s long term leader after the election results are known.